If you are pregnant, you need to take care of your teeth and gum more carefully because pregnant women may have a higher risk of having dental problems. Unfortunately, the dental problems during pregnancy not only affect the mother but may also affect the baby. If the mother has an infection in her teeth or gums, her baby may become premature (born early) or may have low birth weight. One of the most common dental problems that may occur during pregnancy is called “periodontal disease”. Periodontal disease is an infection that happens as a result of the bacteria in your mouth. 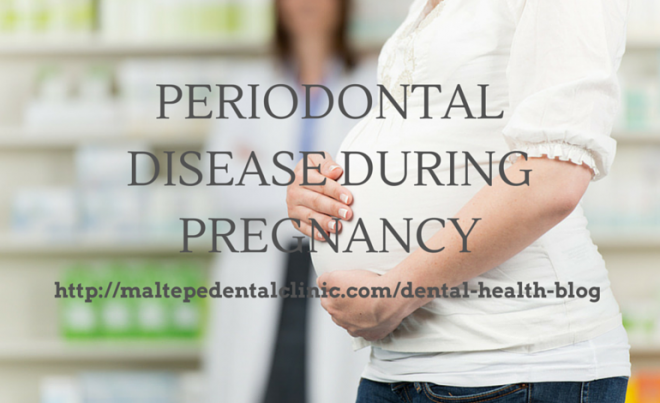 Unfortunately, if you are pregnant you are more at risk for periodontal disease. When you eat sugar, the bacteria makes acid using the sugar you eat. Then, the enamel which is actually the protective coating on your teeth can be destroyed by the acid. All these problems may result in cavities (tooth decay) and even worse tooth loss. Why Are the Pregnant Women at the Higher Risk of Periodontal Disease? There are two main reasons why pregnant women may have this disease with a higher risk. First of all, the changing hormone levels may result in bacteria growth in the mother’s mouth and gums more easily during pregnancy. The second reason is for periodontal disease may occur during pregnancy is nausea and vomiting problem. Especially in the first trimester of pregnancy, the stomach acids from vomiting may break down the enamel coating of the mother’s teeth. Is it Common for Pregnant Women to Have Periodontal Disease? Nearly one-third of all women have periodontal disease during their pregnancy. This number shows that it is a very common dental problem for many pregnant women. Does the Presence of Periodontal Disease Cause Important Problems during Pregnancy? Periodontal disease may cause many important problems if it is not treated on time. Some of the bad results of the disease are as follows. These negative results happen especially in countries where people have very limited access to dental care. What Should Be Done to Prevent from the Negative Results of Periodontal Disease? Periodontal disease is a treatable dental disease. With proper treatment, you can both save your teeth and also prevent prenatal mortality and morbidity. Expecting mothers should realize the link between preventing periodontal disease and improving the well-being of themselves and their infant. Therefore, they need to seek preventative dental care during their pregnancy.